It all began on a Tuesday afternoon, two months ago, with the pursuit of an elusive plant. The plant was a hoya — a tropical climber that bears waxy flowers in fragrant globes. Sonia Pounder, now the co-owner of The Plant Point, had tried all the regular spots — IKEA, B&Q; the very everyday suppliers of the greenery that furnishes her home. The hoya, it seemed, was nowhere to be found. ‘Surely,’ Ada replied, ‘you aren’t the only one wanting to buy it’. They decided, that day, to open a shop that would sell hoyas and other rare plants, and more common plants, and flowers and more. And two months later, they did. For Sonia and Ada, the chance to create the impossible was inspiring. They wanted to share their love of plants in a space that their plants would love too. 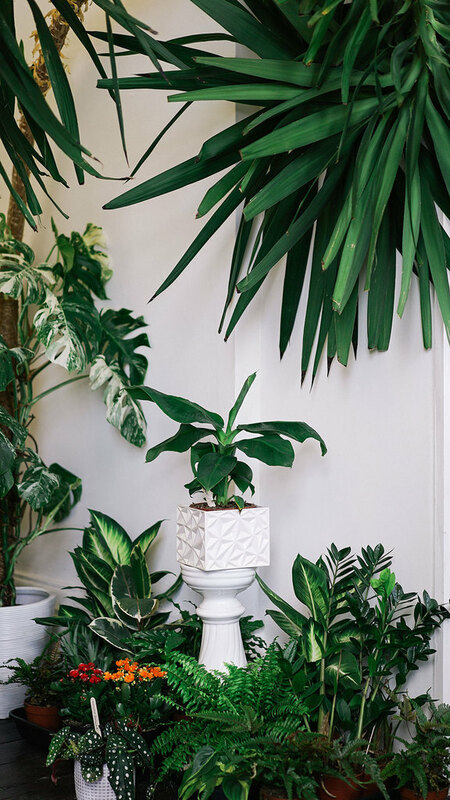 Transforming a unit on the balcony level of the Corn Exchange into an airy jungle was part of that challenge; they carried a twenty year-old yucca plant up the winding stairs one morning, as the security team watched on. The grand yucca is now a canopy for the three hundred or so plants that fill the bright room. “My sister studied landscape design and we both read a lot,” she says. “Before retail, I spent ten years in hospitality; that gave me a very good understanding on customer needs and customer service. She looks over the balcony, to the railing that circles the lower ground floor. “I was thinking of some sort of installation there,” she says.